Many Thanks for your effort on writing this blog. I started reading your blog recently and one of the beneficiary of techniques. I have a quick question, I see you are using 15EMA for 5 minutes chart. What will be the recommended EMA for 3 minutes and 1 minutes charts. I’m not sure why you think I’m using the 15 EMA? Or 5M charts? I use clean charts with price action only. If you want to use EMA’s to structure the chart, that’s fine. But know that there are no “right” EMAs. Instead you need to determine what it is that you want to use the EMA for and then adjusting the setting so that you find the one that best provides that solution. Thank you for the article, another great trade example. Love the break of structured first PB trade, especially on 30-40 degrees upward trend breaks. For a quick scalp. But I often miss it because I am either too cautious (stemming from lack of confidence I suppose) or I wait to much and I don’t get filled eventually (never use market orders). Seeing how the LTF chart went, I am sure I would have missed that. Could you please tell me How did you enter into the trade – with a market or limit order? What is your stance on using market orders in general? The order entry type varies depending upon conditions. I would guess that approximately 80% of the time I enter through a STOP LIMIT order. The other 20% would be either LIMIT or STOP MARKET or MARKET order entry. It’s a matter of choice. Do you want a fill but are willing to take slippage – then use a market order. 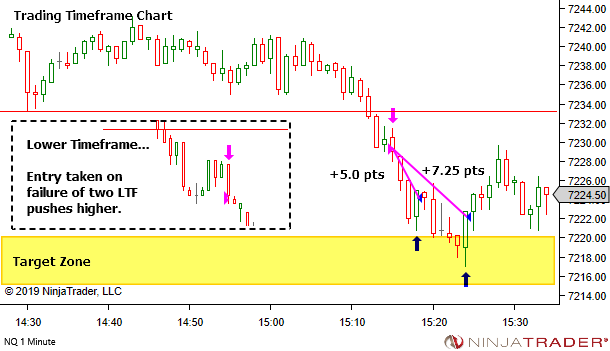 If you want control over price (no slippage) but are willing to accept missed trades or partial fills – then use a limit order. 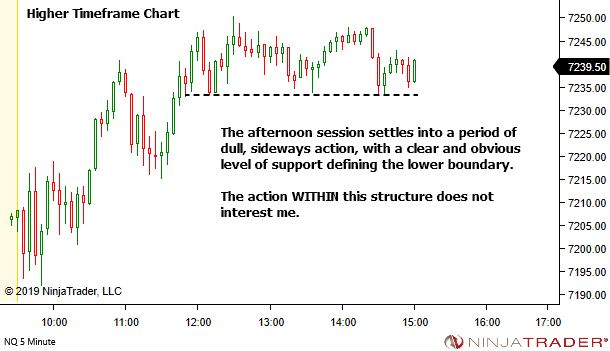 In this type of trade where there is a break of significant structure, there is good potential for directional conviction and follow through. It’s a trade I didn’t want to miss. So entry was STOP MARKET. As best I can recall, the entry order was placed below the LTF candle on the second push higher (the one prior to entry). Had the pullback moved deeper then it simply would have trailed below the low of these LTF candles, triggering when they eventually broke. This way – there was no way I’d miss entry. But it did come with slippage. 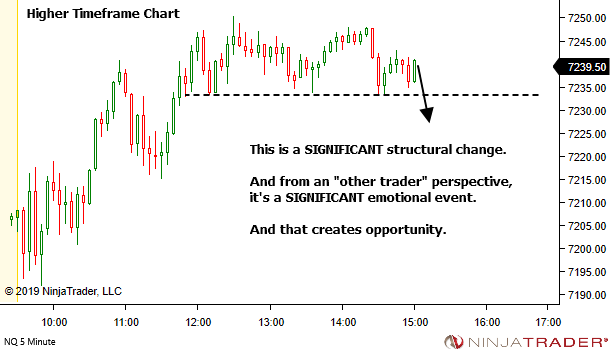 At the time of entry, weakness in the bulls was likely, simply due to the context. When it’s a significant structural change which traps a whole lot of market participants, it’s reasonable to expect a strong directional move (until proven otherwise). And this was then observed through two LTF attempts to push higher, both failing to reach the breakout point. The presence of bullish orderflow at the target zone is not known at that time. The level was chosen as a target simply because it’s a structural area with potential to halt the move. You’ll note however that I didn’t take my exit at the target zone. 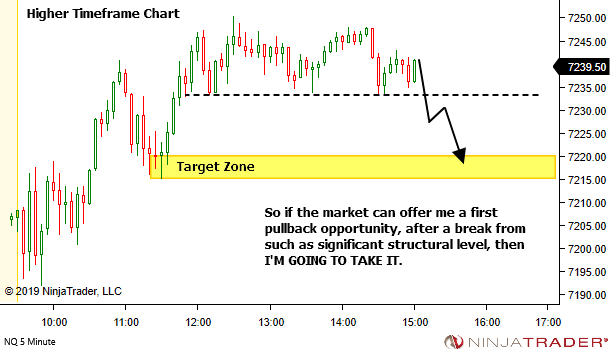 On reaching there I assess potential to break through the zone so I held the trade open. It wasn’t to be though. Exit was taken as the bullish orderflow came into the market and drove back higher. In trending market, when do you expect a CPB and when you expect PB. 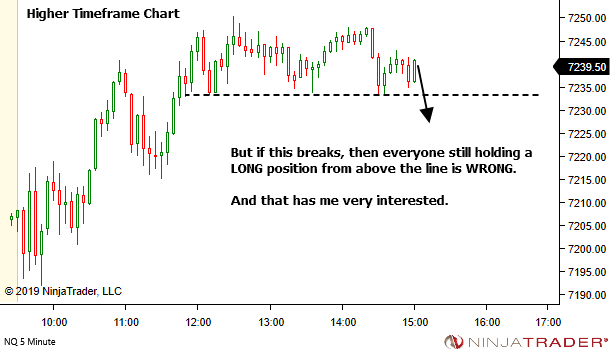 As you said, anticipating future trend direction gives a trader an edge, I am still trying to figure it. It won’t be shared on the blog. 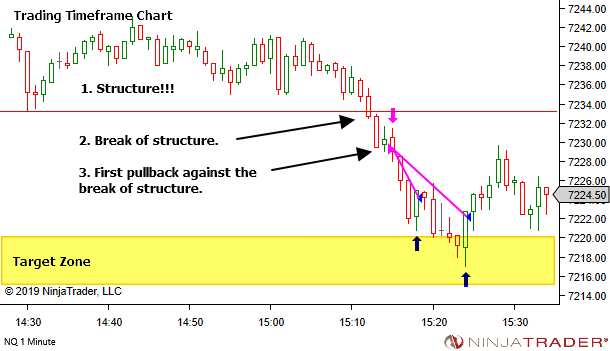 If you have the YTC Price Action Trader and need further assistance with this area, please contact me at support@yourtradingcoach.com so we can discuss it further.